While organizing this article, I made a list of every pre-Columbian ruin I’ve visited on my bike tours, thinking it’d be about six or seven. Nope, thirty five. Thirty five! I had no idea I was such an archaeology nerd. It’s not like I make a pilgrimage to see these sites, but if there’s one nearby (or even near-ish), I have to check it out. I can’t pass up a good ruin. I know cyclists who’ll ride straight past the turnoff sign for a ruin, totally uninterested. This baffles me. I mean, c’mon, you’re right there and you’ll probably never be back; aren’t you even a little curious? Is your route plan so sacred you can’t make any side trips? All right, so maybe walking around a bunch of old buildings isn’t for everybody. Fine. But think of how adding a few archaeological excursions will enhance your tour. You’ll learn something, for a start. Plus, you’ll get some great photos. And – if you give it a chance – you’ll even get a sense of awe, picturing a ruined city in its prime, full of people going about daily life, never imagining their society would collapse. Best of all, you’ll end up in some wild places. From mountain summits to jungle basins, on top of deserts, next to rivers, and inside caves – the ancients built their cities in some extraordinary settings. In fact, if you’re still at the route-planning stage of your bike tour, why not ride from one ruin to another through Latin America. 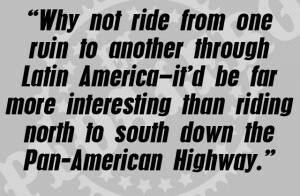 It’d be far more interesting than riding north to south down the Pan-American Highway like so many other tours. If you’re wondering why Machu Picchu or Tikal (outstanding though they are) didn’t make my top three, here are the criteria. No gift shops. No souvenir hawkers. No more than 30 visitors at a time. At least 1,000 years old. Far from cities, cars, or anything modern. And remote – I’m talking river crossings, jungle treks, or at the very least, four-wheel drive. Basically, you should feel like Indiana Jones by the time you reach the ruin. Amazonas Region, 6th century – Chachapoyan culture. A walled fortress on a mountain ridge at 3,000 m, overlooking the Utcubamba River Valley in the north of Peru. A steep and narrow passage leads you up through the 20 m outer wall and into a city of 400 individual stone buildings, many with round walls decorated with geometrical designs. Kuélap has altars, stairways, tombs, and turrets, as well as stone carvings depicting animals and human faces. And the whole city is overgrown with moss, knotted roots, and giant bromeliads that sprout from every corner. On the day I visited Kuélap, I had the entire city to myself – well, almost. The number of visitors might’ve swelled to a teeming twelve by midday. It’s strange this site isn’t more popular (but I’m glad it isn’t). I might’ve given Kuélap first-place ranking if it were a just a little harder to reach (not that it was easy biking for days on the muddy mountain roads that lead to the ruins). Yaxchilán was a major political power in its heyday, when it was known as Pa’ Chan. Chiapas State, 4th century – Pre-Classic to Late Classic Maya. A city and holy site on a dramatic bend in the Usumacinta River on the Mexico-Guatemala border. Inaccessible by road, the only way to get to Yaxchilán is by boat from tiny Frontera Corozal (aka Frontera Echeverría). At the site, the jungle is thick and noisy. Howler monkeys outnumber visitors thirty to one. So do the bats that cling to the wet limestone ceilings of labyrinthine corridors inside the ruins – this is real Indiana Jones stuff. 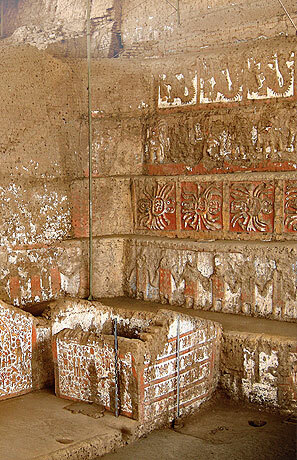 Intricately carved depictions of rulers and rituals adorn the walls, lintels, and stelae, and the entire site oozes with history. 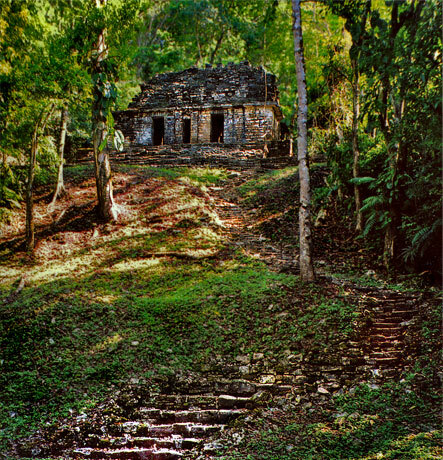 You feel the presence of the ancients at Yaxchilán. And when you’ve finished exploring, head to the river for a cooling swim in the same spot ancient Mayans would’ve swum over a millennium and a half ago, when the city was known as Pa’ Chan. In those days a 100 m suspension bridge spanned the river, the world’s longest for hundreds of years. Worth every blister and every bug bite, Ciudad Perdida is Latin America’s most awe-inspiring archaeological site. Santa Marta Department, 8th century – Early Tairona culture. A series of connected terraces, stairways, and oval plazas in the Sierra Nevada mountains in northern Colombia. 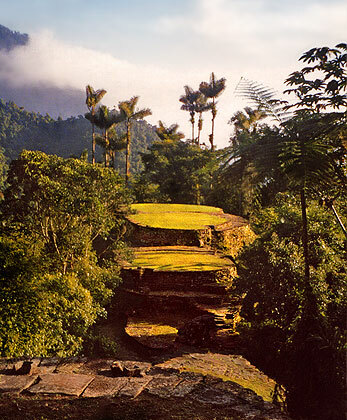 Ciudad Perdida (Lost City) is also known by its indigenous name, Teyuna. And if you want to see the Lost City, you’ll have to work for it – several days of hiking through steep, muddy paths in some very dense jungle. You’ll cross rivers, sleep in hammocks, and come face to face with indigenous tribes, paramilitary troops, and poisonous snakes. Also expect heat, humidity, rain, and insect bites; hundreds and hundreds of insect bites. When I did this hike, heavy rains meant we couldn’t make the final river crossing at the normal spot. Instead, we were forced to machete a path through steep, thorny forest to a safer crossing, upriver. This five-hour detour was draining, but ultimately added to the feeling of accomplishment and mystery when we reached the entrance to the Lost City. A large part of Ciudad Perdida’s appeal comes from the final approach, which could have come straight from a Tolkien novel. 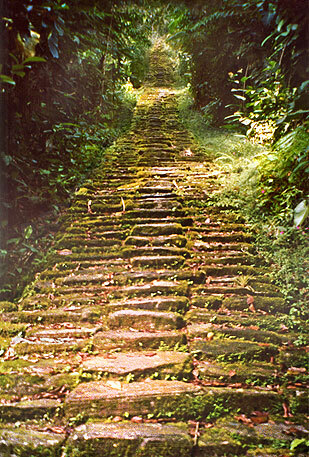 1,200 steps – one for every year of its existence – lead through the middle of the jungle to Ciudad Perdida. Imagine this scene: You’re standing at the edge of a deep, green river that bisects a jungle gorge. On the far side, you notice a small gap in the otherwise unbroken mass of boughs and vines. As you wade toward the gap, you notice mossy stone stairs that start at the water and lead up into the forest. Then you climb – 1,200-steps up a 1,200-year-old staircase through a misty green tunnel to the outer walls of a ruined city. Throw in a few elves and hobbits and you’ve got Middle Earth. 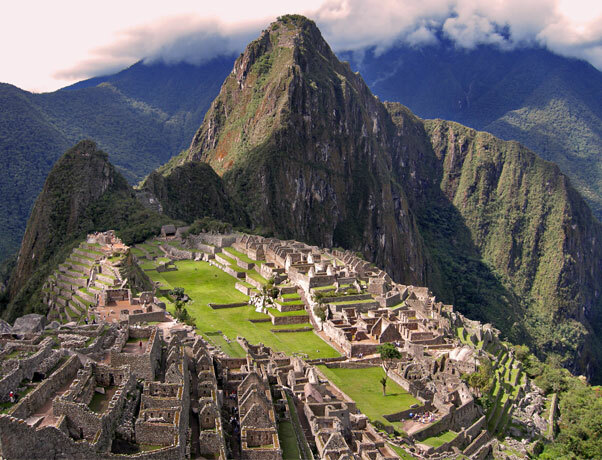 The Lost City sits amid green peaks and above clouds. The views are as impressive as the site and the weather is constantly changing. One moment you’re creeping along slimy stone paths in a foggy drizzle, the next moment, the sun splits the clouds and everything sparkles and steams. The afternoons are sweltering; the nights, chilly. 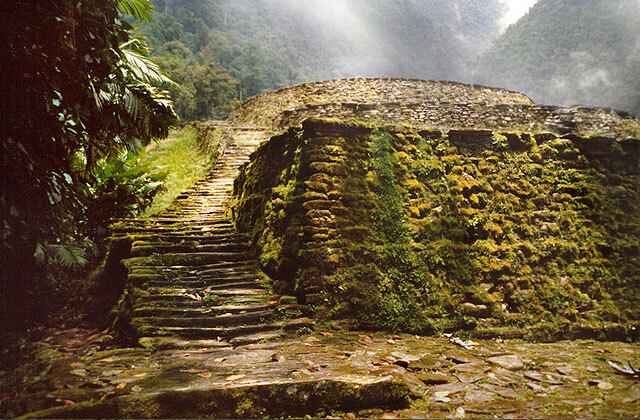 Ciudad Perdida is one of Latin America’s largest ancient cities and very little is known about its history. In my opinion, it’s the best archaeological site in the Western Hemisphere and worth every effort to visit. These sites didn’t make my top three, but they’re so good I couldn’t resist mentioning them anyway. Chan Chan. La Libertad Region, Peru, 9th century. Ek’ Balam. Yucatán State, Mexico, 4th century. Bonampak. Chiapas State, Mexico, 6th century. Copán. Copán Department, Honduras, 5th century. What’s your favourite Latin American ruin? What’s great about it? Leave a comment below. Painted pyramid in the desert. Huaca de la Luna, Peru. 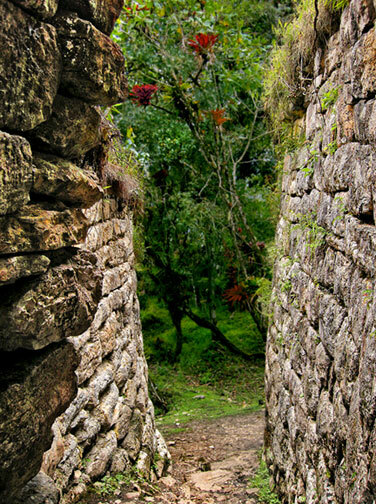 Feature image (top of page): The mossy majesty of Ciudad Perdida, Latin America’s most mysterious ancient city. Aw, thanks Lia! I think you’re very talented too; and an awesome traveller! My favourite ruin is Palenque in Mexico. More touristy than your top three but it was the first one I visited and I think that’s the reason! And thanks to your suggestion a few years ago, I visited Chan chan and Huaca de la Luna. They are great and really interesting. It’s a pity noone visits them. I don’t travel by bike so for me it’s better if ruins can be reached by car, bus, train, or even on foot (Machu Picchu is too touristy, that’s true, but having gotten there after an adventurous 4-day trekking makes it special!). Thanks for the comment, Eu! Palenque, Tikal, Copán, Ek’ Balam – all the Mayan sites are amazing! At some sites, I was able to bike to the front entrance, but the best ones have been off-road adventures. For my next trip, I think I’ll go by river in Guatemala and explore some jungle sites that haven’t been opened to the public yet.